Z-World’s basic Smart Star system. 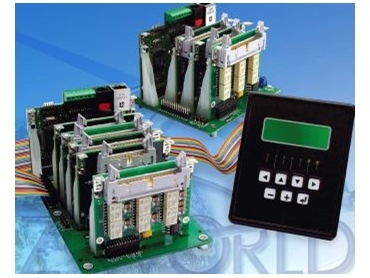 Z-World has added Ethernet connectivity, a low-cost keypad/LCD, and a smaller backplane as new options for its popular Smart Star modular embedded control system, which provides designers with flexible control solutions for a wide variety of real-time control and data acquisition applications. The basic Smart Star system consists of a rugged backplane with power supply, a CPU card, and one or more I/O expansion cards of the customer's choosing. Smart Star now offers two CPU cards -- one with Ethernet and one without -- and an optional keypad/display with backlit LCD, seven user-relegendable keys, and seven LEDs. In addition, two different backplanes are now available, one with seven slots for expansion cards and another with three slots. These slots can host any combination of I/O card options -- digital I/O, A/D, D/A, and relays -- giving designers a customizable platform for their applications. Smart Star's new options are designed to give OEM customers even more flexible functionality than before. The system's modular configuration allows easy interchanging or replacement of individual I/O cards, and its I/O density -- expandable up to 168 I/O -- makes Smart Star a very cost-effective solution. The Smart Star CPU card is powered by the Rabbit 2000 microprocessor operating at 22.1MHz and features 512kB of Flash memory and up to 512kB of SRAM for program and data storage. Programs are developed using Z-World's Dynamic C Premier software development system. An extensive library of drivers and sample programs is provided, along with royalty-free TCP/IP stack with source. For the optional keypad/display, software libraries and a built-in converter program facilitate display of international characters, bitmap images, and graphic constructs such as circles, lines, and squares. Dominion Electronics 02 9906 6989.